Can you believe it's already the second half of 2018?! Time really flies when you are having fun and training hard, right?! Well, that's how it feels like to us. Our love and passion for the sport of OCR is continuously growing. You can see it with the consistent faces that you may have seen continue to train and compete with us throughout the year. This month, we are excited to mix up our training as this will be our first time being indoors at an actual facility that is 7,000 square feet with plenty of new equipment to play with!! Effective Now Through July 31st. DISCLAIMER: The facility is undergoing new management. 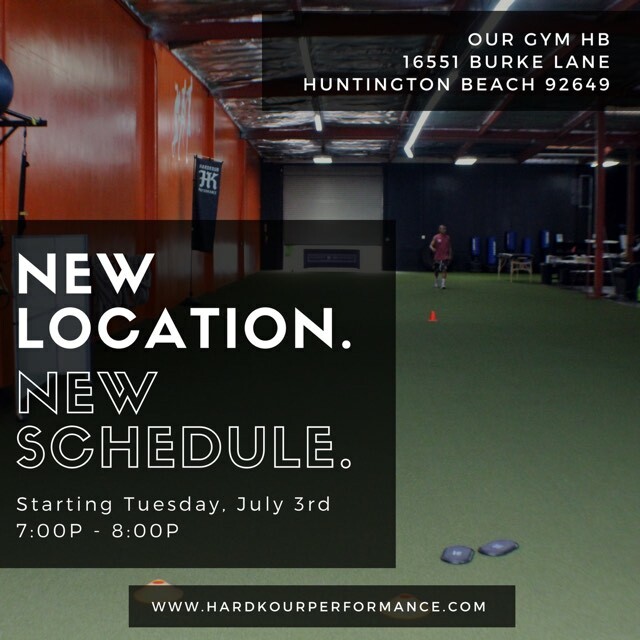 They are known as @ourgymhb on Instagram; however, their map location is still labeled as "Training for Warriors Huntington Beach, CA." Both names are running under the same building. We apologize for any confusion. JOIN US AT OUR NEXT CLASS ! BECOME A HARDKOUR MEMBER !